I am the black sheep of the family and I have lived with their backlash for years. You see, I grew up with an artificial Christmas tree. As a little girl, I have fond memories of waiting for the box to come down from the attic. I’d arrange the branches by color and love every minute of it. Yes, to those real tree lovers, I know that sounds crazy, but I waited every year for that day. The Fake vs. Real Dilemma has deeply rooted emotions. 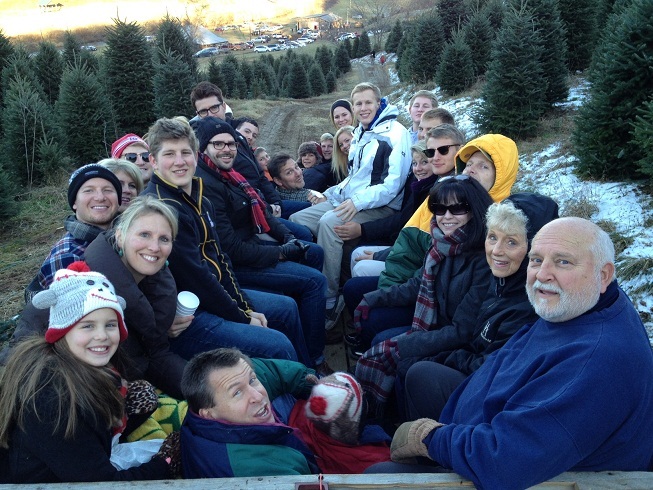 I admit, it’s a bit ironic that every Thanksgiving weekend, our entire extended family heads to the mountains of NC to go on our traditional Christmas tree farm expedition. The bottom line is I know artificial tree and I thought I was fine with my old fake tree until I saw some of my friends Tree Classic trees. I couldn’t review one fast enough. They claim “The World’s Finest Artificial Christmas since 1976,” and I believe them because I have owned a LOT of artificial trees. I received the Sherwood Spruce with clear lights and it’s stunning. It has both the Real Feel needles, which gives it a full lush look, yet also looks more real than any tree I’ve had in the past, as well as the space saver feature. I typically put one tree in our great room and for that space, I’ll need the regular width tree, so I think I’ll add another tree to my wish list for next year. I love multiple trees, but I don’t like the amount of time it takes to set up. These go up so quickly because they are in just a few pieces, and not branch by branch like my others. The real test was going to be that extended family of mine; the dear ones who are firm real tree believers. Since I always host Christmas Eve dinner, and I knew they’d see it, they couldn’t believe it was artificial. Yep, it passed the hardest test of all. Where this table sits is normally where I put our big tree, but I decided to place the garland over the door instead and I just love the coziness it creates. 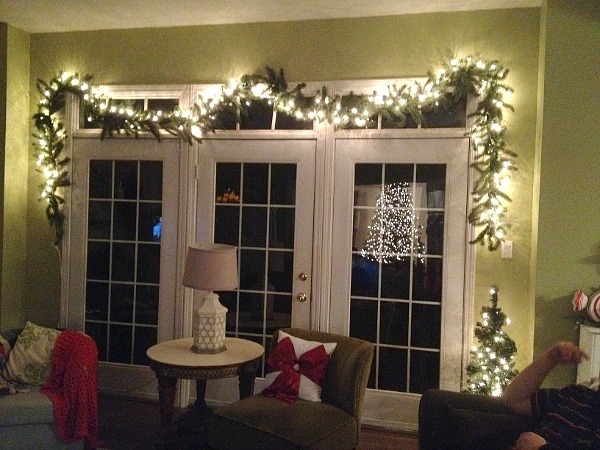 We have multiple french doors, so next year, I’ll know to measure first and get garlands that are just a bit longer. The garlands and wreaths also have that real feel and appearance. I’ve purchased MANY, many artificial garlands in the past and this tops them all. Typically, I’d have to double and triple the inexpensive ones just to make them thick enough and then cover them in lots of ornaments and tinsel to make them acceptable. Not with these. Just alone, without any embellishments, they are gorgeous. 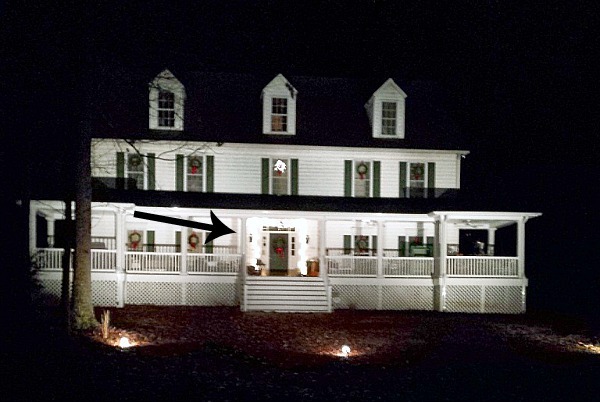 Many of you read about our Porch that Took 17 Years to Build story. 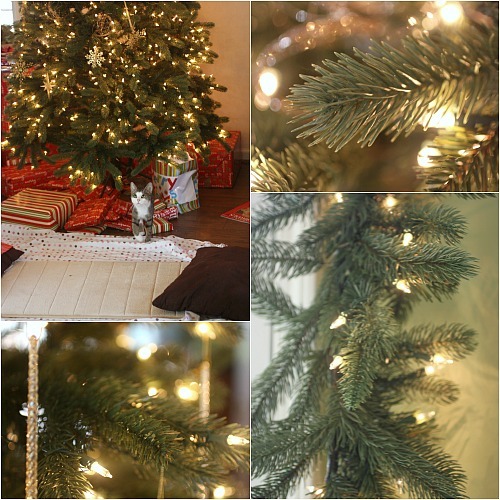 I shared an inspiration picture of how I want to decorate it for Christmas but that didn’t quite happen. It will take a LOT of garland and wreaths and BIGGER wreaths to create the look I desire, so bit by bit, I will add to it as the budget allows, starting with garland for our pillars and a bigger wreath for our middle window. Do you see how cute that one looks? It’s gorgeous up close, but next year, I’ll need one twice as big that’s why now is the time to add to your wish list when items are slashed. I’ve been to many After Christmas sales in the past looking at artificial trees and their 1/2 off prices may be a tad lower, but won’t come close in quality. If you are the market for a tree, wreaths or garland, the slightly smaller investment will be well worth it. Now is the time to purchase because all their items which are up to 75% off with free shipping, but don’t delay. The sale ends now! So, do I dare ask? We have a real tree, but I prefer artificial. We are in a very small house, with very little storage space, and we just can’t spare the room for an artificial one. Maybe the next house! We do a fake tree. I grew up with a fake tree—silver branches that you would stick in, with red ball ornaments that we put on it. My husband and I have fake; we may have bought a few real ones. 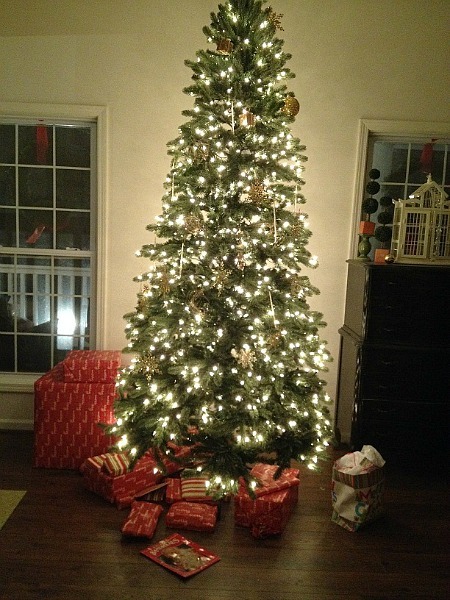 I had a non-prelit tree that I had first seen at someone’s home; I had to touch it to make sure it was fake…it looked that real! Got it at Rich’s years ago. Now that we live in a different house with taller ceilings, we use a prelit that we got used. I’m a fake tree kind of gal. Our last tree had the color coded branches but since it was over 15 years old we decided to get a new one and our new one just comes in 3 parts. It’s super easy but I admit it’s a little too easy for me. LOL! The only time I came close to wanting a real tree was back when we went up to Boyd Mountain in NC. We stayed in a cabin there and it was also a Christmas tree farm. They were setting up their tent while we were there, getting ready to start selling their trees. I was tempted to take one home to Florida with us. But we didn’t so that’s that. LOL! I’ve been lobbying for an artificial tree for years, to no avail. We usually just cut down the baby offspring of a giant cedar tree my grandpa dug up at Yosemite in the ’50s and transplanted behind their (now my parents’) house. They smell marvelous, but are a little droopy and erratically-shaped. They’re free, mind you, which is not insignificant, especially when we were younger and poorer. Ok, something about knowing it’s been transplanted by your grandpa?? oh my – that is SO NEAT!! We do both! We live far from family and travel over Christmas, so we can’t leave a real tree to turn to a crispy fire hazard while we are gone. When we get to our family we get a smaller live tree to put up there just for the week. Best of both worlds!